The client application gets an HTTP status code of 500 with the message "Internal Server Error" as a response for API calls. The 500 Internal Server error could be caused by an error during the execution of any policy within Edge or by an error on the target/backend server. The HTTP status code 500 is a generic error response. It means that the server encountered an unexpected condition that prevented it from fulfilling the request. This error is usually returned by the server when no other error code is suitable. "faultstring":"Execution of ServiceCallout callWCSAuthServiceCallout failed. Reason: ResponseCode 400 is treated as error"
A Policy within the API proxy may fail for some reason. This section explains how to troubleshoot the issue if the 500 Internal Server Error occurs during the execution of a policy. Note: The 500 Internal Server error can arise due to many different reasons. For example, a 500 error can occur when a policy executes or it can originate on the backend target server. Because of this, we've provided below several general diagnostic steps to help you identify and troubleshoot this type of issue. We also provide several examples that give specific steps for resolving these errors, depending on the cause of the problem. Verify that the error was caused by the execution of a policy. See Determining the source of the problem for details. If the error occurred during policy execution, continue.. If the error was caused by the backend server, go to Error in the Backend Server. Select the API request that is failing with 500 Internal Server Error in the trace. Examine the request and select the specific policy that has failed or the flow named "Error" that is immediately following the failed policy in the trace. Get more details about the error either by checking the "error" field under the Properties section or the Error content. Using the details you've collected about the error, try to determine its cause. Verify that the error occurred during the execution of a policy. See Determining the source of the problem for details. If the error was caused by policy execution, continue. If the error occurred during policy execution, continue. If the error was caused by the backend server, go to Error in the Backend Server. Check the Message Processor logs (/opt/apigee/var/log/edge-message-processor/logs/system.log) and search for the unique request message id in it. If you do find the unique request message ID, see if you can get more information about the cause for the failure. If you have determined the cause of the issue with the policy, try to correct the problem by fixing the policy and redeploying the proxy. The following examples illustrate how to determine the cause and resolution for different types of issues. If you need further assistance in troubleshooting 500 Internal Server Error or you suspect that it's an issue within Edge, contact Apigee Support. If the call to the backend server fails within the Service Callout policy with any error such as 4XX or 5XX, then it will be treated as 500 Internal Server Error. failed. Reason: ResponseCode 404 is treated as error"
In this example, the "error" property lists the reason for the Service Callout policy failure as "ResponseCode 404 is treated as error". This error might occur if the resource being accessed via the backend server URL in the Service Callout policy is not available. Check the availability of the resource on the backend server. It might not be available temporarily/permanently or it might have been moved to a different location. Fix the backend server URL in the Service Callout policy to point to a valid and existing resource. If the resource is only temporarily unavailable, then try making the API request once the resource is available. Let's now look at another example, where 500 Internal Server Error is caused due to an error in the Extract Variables policy and see how to troubleshoot and resolve the issue. The Error Content indicates that the"serviceCallout.oamCookieValidationResponse" variable is not available in the Extract Variables policy. As the name of the variable indicates, it should be holding the response of the preceding Service Callout policy. Select the Service Callout policy in the trace and you might find that the "serviceCallout.oamCookieValidationResponse" variable was not set. This indicates that the call to the backend service failed, resulting in an empty response variable. Select the "Analytics Data Recorded" phase from the request. Scroll down and note the value of X-Apigee.Message-ID. Note: The following steps can only be carried out by the Edge Private Cloud users. The above error indicates that the Service Callout policy failed due to a connection timeout error while connecting to the backend server. When the backend server is not configured to allow traffic from the Edge Message Processors. If the backend server is not listening on the specific port. In the above illustrated example, though the Extract Variables policy failed, the actual cause was that Edge was unable to connect to the backend server in the Service Callout policy. And the cause for this failure was that the backend end server was not configured to allow traffic from the Edge Message Processors. Your own Extract Variables policy will behave differently and may fail for a different reason. You can troubleshoot the issue appropriately depending on the cause for failure of your Extract Variables policy by checking the message in the error property. Fix the cause for error or failure in Extract Variables policy appropriately. In the illustrated example above, the solution was to rectify the network configuration to allow the traffic from Edge Message Processors to your backend server. This was done by whitelisting the Message Processors' IP addresses on the specific backend server. For example, On Linux, you could use iptables to whitelist or allow the traffic from Message Processor's IP addresses on the backend server. Let's now look at one more example, where 500 Internal Server Error is caused due to an error in Java Callout policy and see how to troubleshoot and resolve the issue. In this example, the "error" property under the Properties section reveals that the failure is due to expired password being used while connecting to the Oracle Database from within the JavaCallout policy. Your own Java callout will behave differently and will populate a different message in the error property. Check the JavaCallout policy code and confirm the correct configuration that needs to be used. Fix the Java callout code or configuration appropriately to avoid the runtime exception. In the illustrated Java callout failure example above, one would need to use the correct password for connecting to the Oracle database to resolve the issue. A 500 Internal Server Error could also originate from the backend server. This section explains how to troubleshoot the issue if the error comes from the backend server. The cause of other backend errors can vary widely. You will need to diagnose each situation independently. Verify that the error was caused by the backend server. See Determining the source of the problem for details. If the error was caused by the backend server, continue. If the error occurred during policy execution, go to Execution Error in Edge Policy. If the UI trace is not available for the failing request, then check the backend server logs to get details about the error. If possible, enable the debug mode on the backend server to get more details about the error and the cause. If you have a Trace session, then the following steps will help you diagnose the problem. In the Trace tool, select the API request that has failed with 500 Internal Server Error. Check the "Response Content" section to get details about the error. In this example, the Response Content which is a SOAP Envelope, shows the fault string as "Not Authorized" message. The most likely cause for this issue is that the proper credentials (username/password, access token, etc.) are not passed to the backend server by the user. This issue can be fixed by passing the correct credentials to the backend server. If the backend is a Node.js Backend Server, then check the Node.js logs for the specific API Proxy in the Edge UI (both Public and Private Cloud users can check the Node.js logs). If you are an Edge Private Cloud user, you can also check your Message Processor logs (/opt/apigee/var/log/edge-message-processor/logs/system.log) for more details about the error. Once you've identified the cause of the error, fix the issue in your backend server. Check if the error is thrown from your custom code and fix the issue, if possible. If the error is not thrown from your custom code or if you need assistance, contact Apigee Support. Use one of the following procedures to determine if the 500 Internal Server Error was thrown during the execution of a policy within the API proxy or by the backend server. Note: The steps in this section can be performed by both Public and Private Cloud users. If the issue is still active, enable the trace in UI for the affected API. 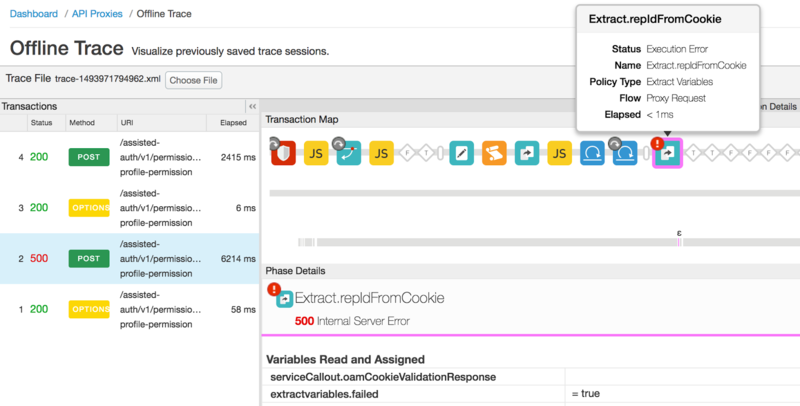 Once you have captured the trace, select the API request that shows the response code as 500. If the error is thrown during the execution of a policy, then proceed to Execution Error in an Edge Policy. If the backend server has responded with 500 Internal Server, then proceed to Error in the Backend Server. Step through a sample scenario that demonstrates how to troubleshoot 5xx issues with your APIs using API Monitoring. For example, you may want to set up an alert to be notified when the number of 500 status codes or steps.servicecallout.ExecutionFailed faults exceeds a particular threshold. Note: The steps in this section are for Edge Private Cloud users only. Check the Nginx access logs (/opt/apigee/var/log/edge-router/nginx/ <org>~ <env>.<port#>_access_log ). Search if there are any 500 Errors for the specific API proxy at the specific duration. Proceed to Execution Error in an Edge Policy if it is a policy error. Proceed to Error in Backend Server if it is a target server error.